Most Creative Marketing Initiative: Native Roots - Look at Native Roots, look at the fluidity and relevance of the branding. People recognize the brand whenever they see it. Every facet of the company is incorporated the logo. Most Innovative Product or Service: Mary’s Medicinals - Mary's Medicinals creates the most effective, accurately dosed products utilizing state of the art, clean delivery methods; while maintaining industry leading accountability driven by a patient-first mentality. Most Innovative New Initiative: Women Grow - A national organization designed to connect, educate and empower professionals in all sectors of the Cannabis Industry. And because we wanted a place of opportunity that celebrated diversity as much as it celebrated success, we decided to call it: Women Grow. Most Disruptive Use of Tech: Quantum 9 - Quantum 9's web-based seed-to-sale inventory tracking software, Atlas, provides government oversight for regulatory agencies. Best Charitable/Community Outreach Program: American Cannabis Nurses Association - Cannabis nurses will be the needed portal for trusted medical cannabis information until medical doctors are comfortable fully implementing cannabis in healthcare. Best Patient Experience (Specifically Medical): SPARC - SPARC is known by industry leaders and members alike as having a beautiful, award winning interior design, and SPARC has been dubbed the "Apple Store" of medical cannabis by the Wall Street Journal. Best Consumer Experience (Adult Use): The Farm Co.- The Farm provides a comfortable, educational and unique experience. Aside from our wide selection of flower we have a gallery of glass, art and merchandise to keep you occupied while you wait. Best Eco-Friendly Initiative: Terrapin Care Station - In response to the estimated 287,279 pounds of marijuana sold in Colorado this year and the millions of containers used to package it, Terrapin Care Station was the first to use eco-friendly containers composed of FDA-approved, recycled milk jug plastic and manufactured specifically for the marijuana industry. Most Popular Brand or Product: Sweet Grass Kitchen - Sweet Grass Kitchen's in-house cultivation ensures a consistent and reliable crop-to-table delivery. Instead of using hash or harmful extracts, all products are made using our own slow simmered, triple strained, full flower cannabutter. Most Influential Person/Organization in the Industry: National Cannabis Industry Association - The NCIA has effectively unified the industry in order to advance our political interests on the national stage in a coordinated way. NCIA is by far the largest trade association in the cannabis industry and the only one operating nationally. Please scroll down for the 2015 winners. 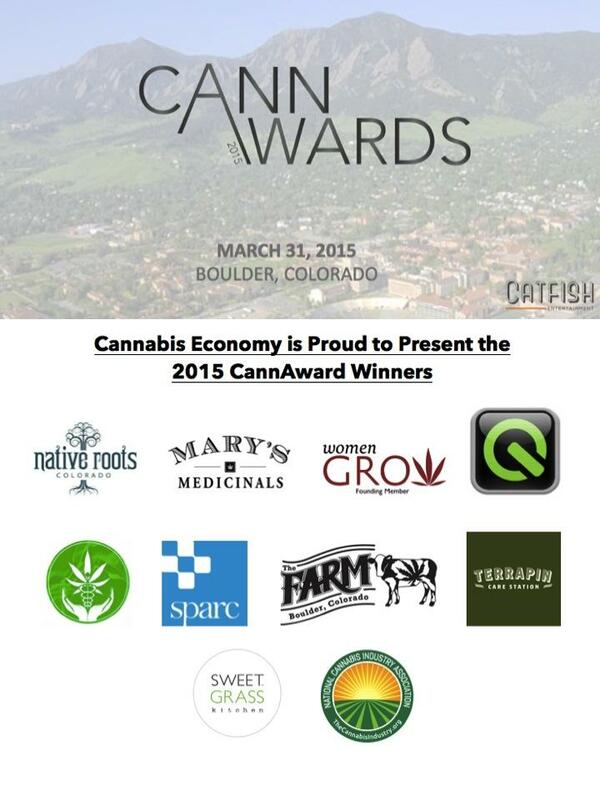 For additional information please email us at info@cannabiseconomy.org.